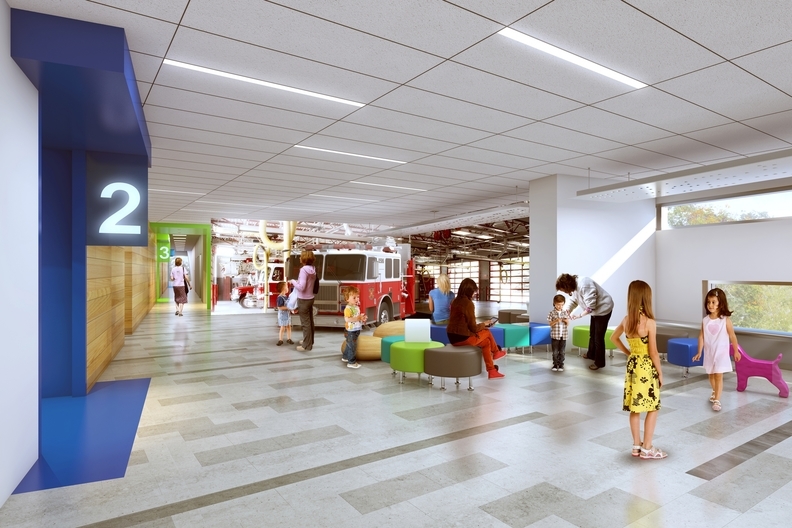 A rendering shows what will greet patients and visitors at Erlanger Children's Hospital Outpatient Center. Erlanger Children's Hospital Outpatient Center will come outfitted with a few unusual bells and whistles—attached to some big ole trucks. McCarthy Building Cos. has taken on the challenge of creating a space where children also feel engaged and distracted from their illnesses during their care, an idea formulated by Erlanger's new hospital and construction coordinator, Bruce Komiske. With the addition of two real trucks for the kids to enjoy upon entering the center, McCarthy has taken extra-heavy steps to achieve the Chattanooga, Tenn., hospital's vision. “Buildings and spaces can affect a person's mood, and a positive attitude is perhaps the best medicine,” said Will Gaither, McCarthy project manager. “We realized quickly that there were going to be some special requests during construction and decided in advance we would never say 'no' but rather find a way to make it happen,” Gaither said. A restored purple 1941 tow truck named Sally (complete with purple trim, kissy-lips and large eyelashes) along with a modified engine cab from the Chattanooga Fire Department will get new homes in the outpatient center, which will double as the entrance to the children's inpatient center and the expanded neonatal intensive-care unit and Women's Hospital. Getting the trucks into a building under construction was no easy task. McCarthy hoisted the vehicles on a large platform by crane and lifted them to the corresponding floor where workers waited to direct them onto the landing. Each floor of the hospital will be themed and include interactive discovery centers that include the trucks and other activities. The official opening date is set for Dec. 17.